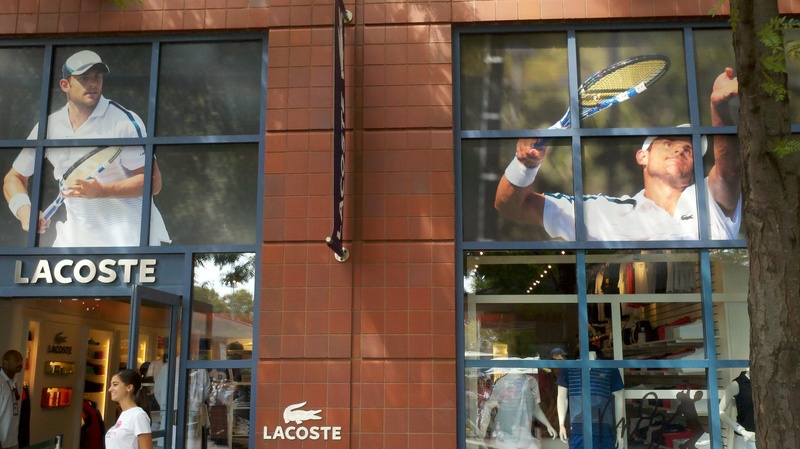 Lacoste gives its newest initiative — the Andy Roddick Collection — a heavy push at its on-site store at the USTABJKNTC. We wonder if the public will bite. sunday survey: an omen for a-rod? A bad sign? 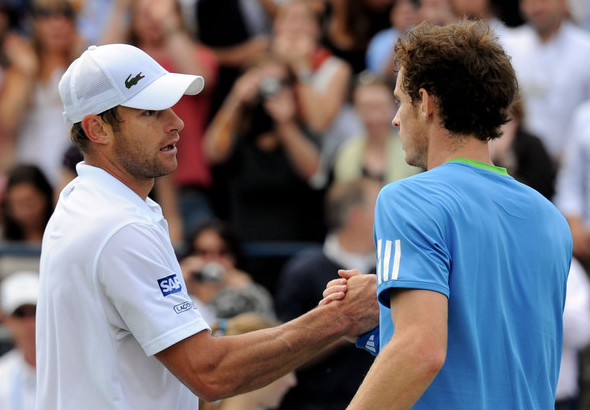 In the semifinals of Queen’s Club on Friday Andy Roddick was absolutely drubbed by Andy Murray, 6-3, 6-1. Should the American worry? He doesn’t think so. 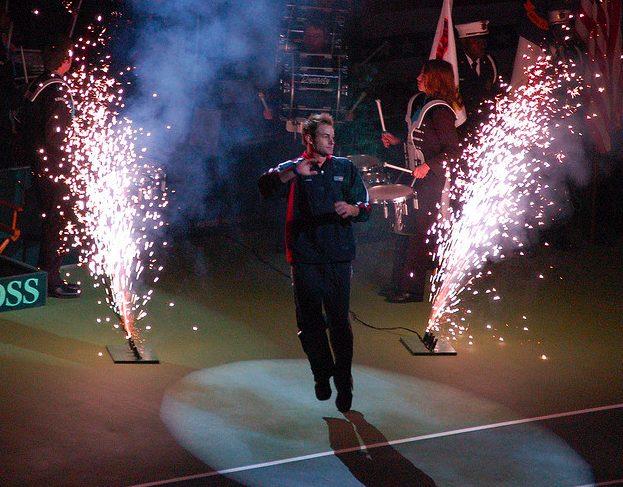 “Everything he touched turned to gold,” Roddick said after the match. “He played great. I felt like I hit the ball well.” But no matter what the American said, it couldn’t have felt great to be run off the court by Murray after his long layoff, that saw Roddick miss the French Open. 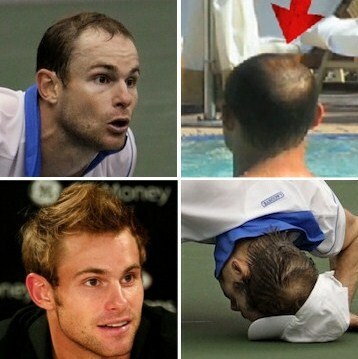 Should Roddick take special meaning in his loss to the world no. 4? Tell us below. Andy Roddick and Lacoste take their partnership to the next level by creating a signature collection specifically for their star mascot. (Note the logo/autograph on the lower-right corner of the tops pictured). The sportswear line will include polos, shorts, track pants and jackets, which Andy’ll wear exclusively while competing. The goods will be available for sale on July 1. FYI, Andy did not play in this year’s French Open because of a shoulder injury. 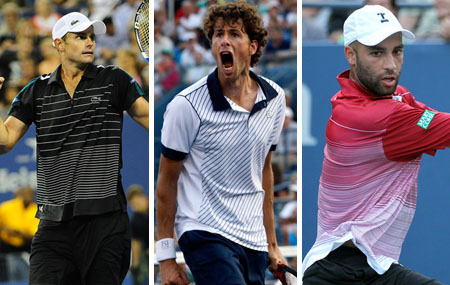 A sign of the times: Both Andy Roddick and Juan Carlos Ferrero, each ranked no. 1 in the world in 2003 (Roddick won the USO over JCF after JCF had captured the French), pulled out of the French today. 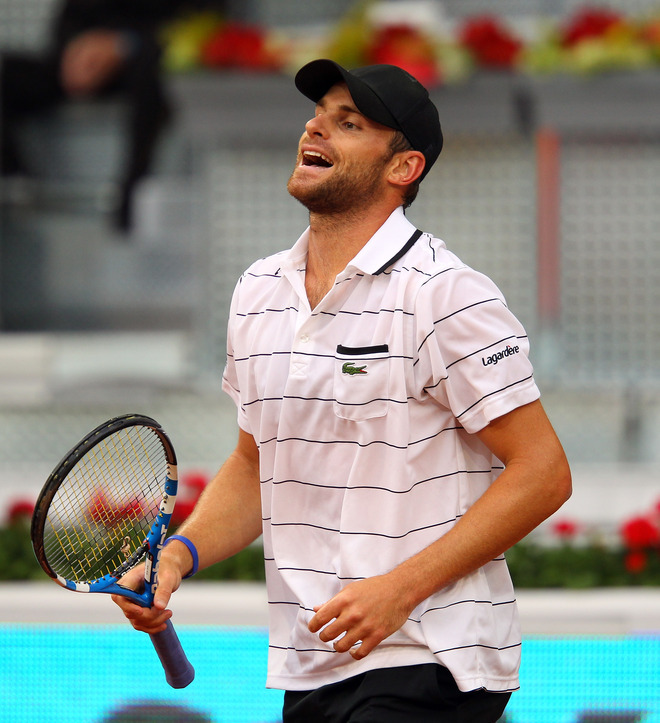 Roddick cited a shoulder injury, as did Ferrero. Cue the their-careers-are-done obits now. Throwing in the (clay) towel: As @TheSliceTweets pointed out, A-Rod’s shoulder seemed just fine in Tuesday in Nice. Roddick‘s out, but for the curious: Lacoste Short Sleeve Super Dry Stripe Polo; in black and white colorways; $85; lacoste.com. Note that wide contrast stripe on the pocket. If everything is bigger in Texas, this may as well be one of the biggest moments of Andy Roddick‘s life. The announcement a couple weeks ago that his adopted hometown of Austin, Texas, will host the Davis Cup quarterfinal between the U.S. and Spain on July 8-10 this summer potentially pits Roddick against Rafael Nadal in a showdown that could be one of the highlights of the American’s career. Roddick and others were buzzing this past week when the USTA pre-sale tickets went on sale (80 percent of the entire venue) for the event at the Erwin Center on the campus of the University of Texas and sold out with two hours – America seems to be pretty pumped, too. General tickets went on sale yesterday, with prices ranging from $90 to $500 for weekend tickets. Last time these two squads met on American soil it was the U.S. who prevailed – but the Spaniards were without Rafa. So what about this time? 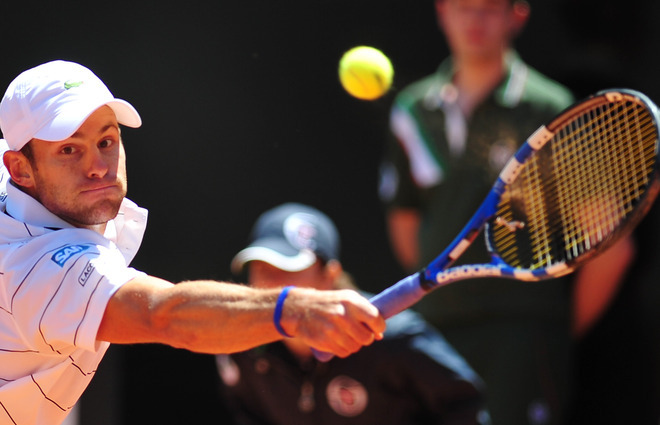 Will Roddick pull out an epic win? How important do you think this tie is? Tell us in the comment section! “A 7-iron, please” On the day before The Masters, the two “sissy” sports – tennis and golf – crossed paths in the most unusual of ways. There was Andy Roddick, tennis superstar, as a caddy for a Par 3 tune-up at Augusta National. Roddick carried the clubs for Zach Johnson after he has expressed interest in swinging through The Masters to his agent. His thoughts on Augusta? “Places rarely live up to the hype. This place surpasses it.” Perhaps Roddick would like to skip the clay court season altogether and stay on the grass. Would you like Roddick to caddy for you? Another player? Tell us! 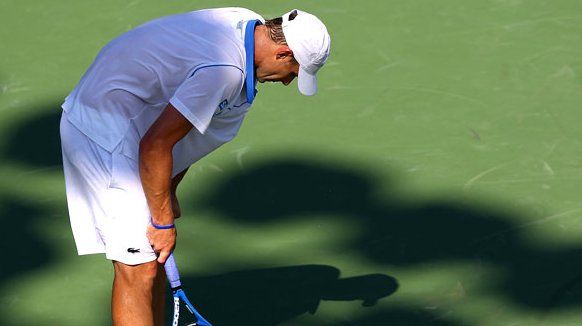 A few months ago, Andy Roddick hit what he called one of the best shots of his career. It was a diving save, one in which Roddick smacked a forehand down the line on match point to win a third set tie-breaker against up-and-comer Milos Raonic and capture the Memphis title. And while the web went abuzz with the video of the shot, many viewers weren’t actually watching Roddick’s shot. Instead, they were paying attention to a cap-less Andy, his hat having fallen off in his exertion of effort. And what was there to see? Not much, actually. An almost-bald Andy.Hair loss and tennis go hand and hand. Male pros often play into their mid or late 30s, meaning as they start to lose their hair, it’s left for all the public to see. Andre Agassi freaked out about it so much that he donned a fake hairpiece that had the world fooled. Pete Sampras has been so nonchalant about his after-career hair thinning that he doesn’t even seem to notice. But we notice – we always notice. TSF has collected the hairdos (and don’ts) from around the tour in what we’re calling “The All-England Club for Men’s Hair Loss,” where styles differ from member to member, but everyone has one thing in common: they’re going – or already are – bald. 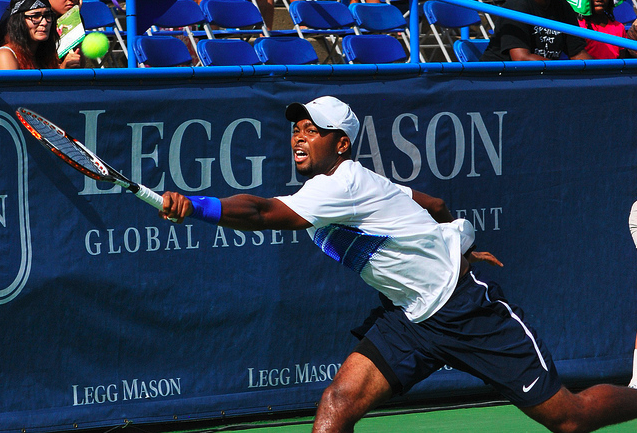 Flip flop: As the Sony Ericsson Open winds down, two very different players are working their way up in the rankings. For the men, it’s Mardy Fish, who overtook Andy Roddick as the top American man with a win over David Ferrer in the quarterfinals. A sick Roddick succumbed to Pablo Cuevas in the second round of the huge hard court Miami event and was bounced out of the top ten for the first time in some years. … but no royal wedding, yet: Apparently, the 23-year-old Maria is in “no rush to get married,” according to Show Biz Spy. And why should she be? We’d like to see Maria win two or three more Majors – she’s got them in her, we think – before strolling down to take Sasha’s hand. Meanwhile: No playoffs for his Nets. Swan song for Petko’s dance? While Petkovic even has the ever-awkward Ana Ivanovic shaking her tail feather on the tennis court, the German – who is matching her play to her popularity this week – is retiring her famous jig following this week. 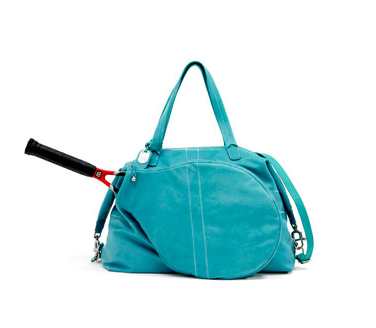 She told the press that it’s time to move on from the ditty, which became an underground hit in tennis realms. Is she lending her dance skills to B-Spears? We sure hope so. But notice: She said “move on.” We’re sensing another dance number folks, just something new and, well, so Petko. ‘Round the world: Then there are the two Missoula, Montana, teens who just broke the Guinness World Record for the longest singles tennis match, ever. Isner-Mahut looks like a Roehampton side court to this Centre Court effort. The two high school seniors clocked in nearly 61 hours of tennis over three days before collapsing, raising $7,000 for charity in the process. Snaps for those court warriors. 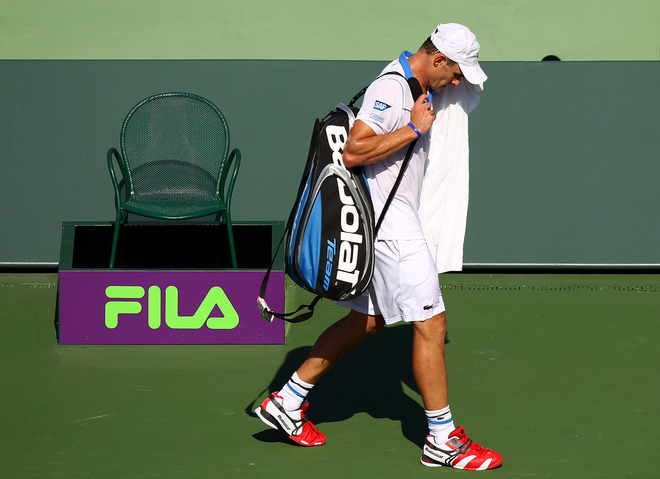 Spring blues: Andy Roddick hobbled his way to an early exit at the Sony Ericsson Open on Saturday. He finished the match but seemed bothered all along by an unidentified injury and some chest congestion (whatever it was, he needed three visits from the trainer). 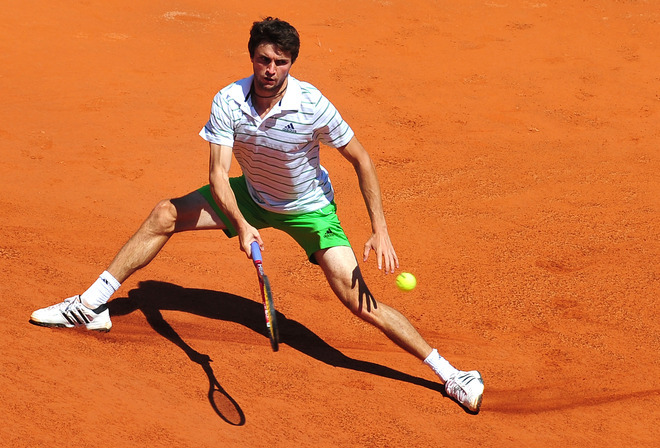 Draw: Cuevas will face Gilles Simon in the third round; Simon beat Rainer Schuettler 6-4, 6-3. Buy: Lacoste Johnny Collar Super Dry Tennis Polo; in White/Blue, White/Black, and Black/White colorways; $85; tennisexpress.com.